Happy fall, y'all! The first few weeks of school have flown by - hope they have been as smooth for you as they have for us (knock on wood!). Speaking of schools, we have updated our Education & Schools Page with new tuition rates, new program director names, and the new website for Chapel Hill-Carrboro City Schools. With great disappointment, we also removed the listings for PACE Academy and the Dynamic Community Charter School, two charter schools known for serving special needs students that our state decided to kill off this summer. Grrrr. 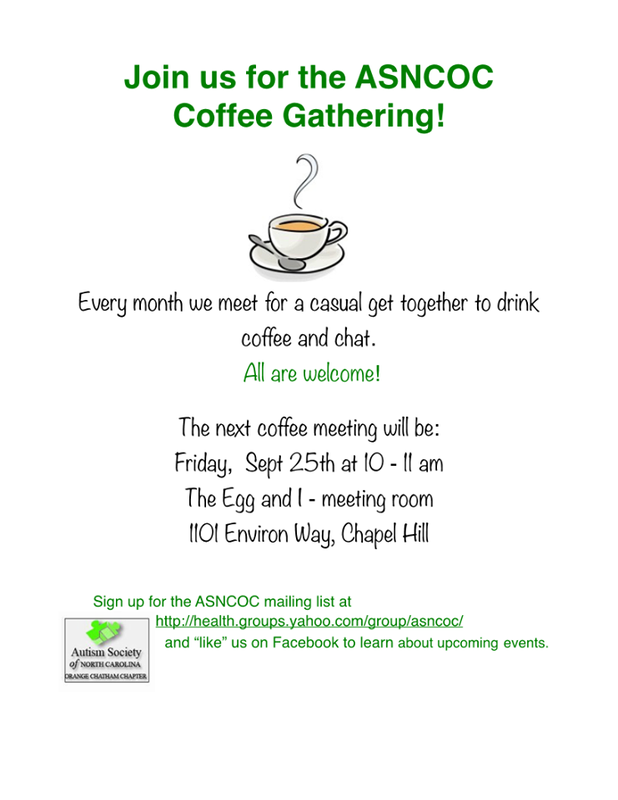 In other news, this Friday is the first ASNCOC (Autism Society of North Carolina Orange Chatham Chapter) Coffee Gathering of the school year. The coffees are a great chance to get together and chat with other parents and professionals who "get" autism. See below for the details. Do you know of another great school that serves kids with autism? Please leave a comment and let us know - thanks!